Shed excess pounds with weight loss art. A love of crafting is a powerful thing, whether you're passionate about quilting or card making. If you've been struggling to drop those excess pounds, crafting may even be your ticket to permanent weight loss. For many years, scientists have known that the act of creating makes us feel good. Crafting boosts your self-esteem while helping you build new skills and a sense of accomplishment. At nursing homes across the country, seniors use crafts to raise their spirits and keep their minds sharp. Craft projects are an important part of occupational therapy plans when a person is recovering from a serious injury or illness. Child psychiatrists even use crafts to help traumatized children work through their problems. If you've been unsuccessful with previous diets, discovering the therapeutic value of crafting may be the answer you've been searching for. 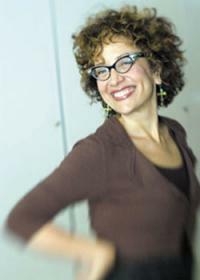 Weight loss coach Janice Taylor coined the term "weight loss artist" to describe someone who creates art about food instead of eating it. After struggling with her weight for several years, she decided to face down the enemy by creating art projects that explored her relationship with food and encouraging others to take the same proactive approach to weight loss. The craft projects in Our Lady of Weight Loss are quirky and eclectic. You can make a macaroni and cheese box alter to Our Lady of Weight Loss, sew yourself a piece of calorie-free chocolate cake, and create collage greeting cards to send to friends and family who have been supportive of your weight loss efforts. You'll even learn how to decorate a "Non-Piggy" bank that encourages you to save for a special shopping spree by making deposits whenever you say no to unhealthy food choices. Recently, Janice Taylor took the time to answer a few questions about weight loss art for the readers of LoveToKnow Crafts. Why do you think so many women struggle to maintain their weight if we all know the basic idea of a diet is to simply eat less food? Remember, it's easy to get lost if you don't know where you are going. So, weight loss is about moving toward your compelling future. Where are you going? What do you really want to accomplish? Permanently removing excess weight can fuel you to move forward in every area of your life. If you are simply losing weight, you will find it. Permanent Fat Removal is about your entire life - a holistic view. In your opinion, what is the link between weight loss and crafting? Wouldn't it work just as well if I played a board game every time I felt hungry? It's difficult to eat with glue and glitter on your hands! And you wouldn't want to get food on your work, would you? Crafts activate the creative part of your brain, keep your hands busy - you are in the flow. Hours can go by and you don't even notice! Crafting is a powerful tool. Why do you recommend that your readers keep a food journal? Studies show that those who keep food journals lose more. If you are committed to writing every bite down, you are less likely to pop something in your mouth. And for crafters - for those who love scrapbooking - you can combine keeping a journal with making a scrapbook. You can track your food and make it pretty. Add photos, too! A double win. How does exercise fit into your weight loss plan, since crafting is a fairly sedentary pursuit? Crochet yourself a cute walking outfit! Sew yourself some hot pants and BeDazzle them. All kidding aside, I power walk every morning to some really fun tunes and it clears my mind, and creative ideas for future projects surface. Exercise clears your mind and helps you to be creative! How do you find the inspiration for your projects? I find inspiration a total mystery. Really - where do Ideas come from? The ethers! I was pulling tomatoes out of the mesh bag. My wedding band got entangled, my hand stuck, and I realized that these mesh bags would make beautiful gloves. They're going to be in a museum show I'm exhibiting in this coming October! 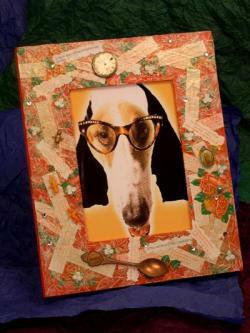 This fortune cookie picture frame is just one of the many fun projects Janice features in her book. Pearls, diamonds, little babies, assorted junk! Using one of those fab sponge brushes, give your wood frame a coat or two of orange and/or red paint. Then rip up some rice paper into bite-size pieces. Dip one of your sponge brushes into the craft paste, and glue down the rice paper, putting craft paste under and over the paper. Rice paper has a great transparency to it. It "melts" into the frame and over your work, giving an illusion of layers. Then paste the fortunes down, any which way. "Controlled chaos" is my m.o. Another layer of rice paper. More fortunes.Then top it off with a little of this and a little of that. I found an old spoon and toy babies in my box of odds and ends. Perfecto! 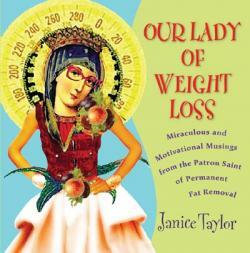 Our Lady of Weight Loss: Miraculous and Motivational Musings from the Patron Saint of Permanent Fat Removal is available for purchase at your local bookstore or online at Amazon.com. Visit the Our Lady of Weight Loss website to learn more about creating your own weight loss art or to become a member of Janice Taylor's "Kick in the Tush Club." For more great information on eating right and losing weight, check out the helpful articles at LoveToKnow Diet. 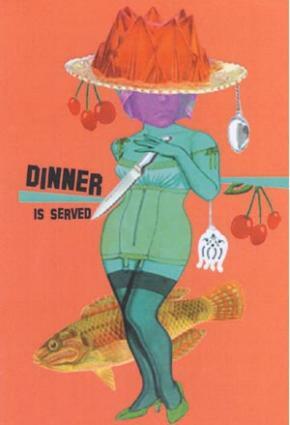 ~ A review copy of Our Lady of Weight Loss was provided by the publisher.